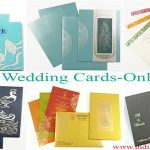 Most wedding cards that feature these days are either taken from the contemporary galleries or match the imperialistic art forms. Identify a conceivable design that can make it to the heart of the guests. It is imperative to do bit of research on fashion styles, engineering and origami. We tell you 8 sources of inspiration that you can actually use for your wedding card design. Send your wedding card invite to the relatives and guests through a dummy smart phone. Most people would be smitten with your idea of combining technology with the wedding affair. Smart phones are available at cheaper rates these days. 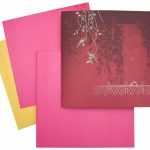 The smart phone wedding card designs can work wonders if you are planning to throw lavish event, and have a limited number of guests on the list. Circus is one gala event that throws everyone into splits with their dazzling performances and skills. Use circus hoops and miniature articles to create a wedding card design that looks totally funky. 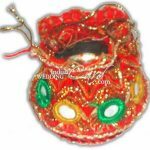 It allows you to sport a more extravagant series of articles and stuffs like sequins and hooks. The Garden of Eden is an exorbitantly fragrant wedding card design. It is not showy, but exudes blend of the most exotic fragrances. 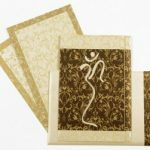 Use of perfumes and aromatic oils that leave their impression over a long period of time go a long way in ensuring the magical effect of Indian wedding cards. You can also use wild orchids as the backdrop, flushed with formaldehyde solution to prevent it from decaying. 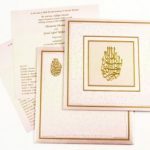 The natural look of the wedding card is a heart-felt invitation message sent to the guests. Though, they come in limited volume, it is worth taking a shot at the Wedding cards based on the concept of Garden of Eden. 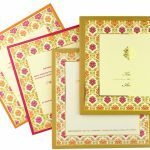 Leave your guests under a spell of magical impression by designing a wedding card based on psychedelic patterns. Use concentric hoops, circles and lines to create myriad versions of animals, hearts and stars. You can also lace a laser tip to create the effect for you. Most electronic engineers will pitch in for your wedding card if you are set for a novel wedding idea. 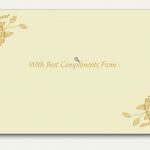 You may not be having a farm house wedding, but leave your imagination on the roll by conceiving a wedding card design that is inspired by the ambience of humble farm yard. You can go organic by using recycled materials and add a bit of smartness by inserting audio modules that has chirping of birds. Grassy feeling and the fragrance of wet land still haunts the imagination of all humans. Take it to a next level by reflecting your ideology though the wedding cards. Either learn origami or grab an expert to cut out and fold the recognizable patterns using paper. Highlight your theme and intention of using origami for your wedding card design. You can use an assortment of designs. It looks a bit tiresome, but trust the impact it creates remains unmatched.